The central government on Tuesday approved Rs 103.30-crore assistance to the flood-hit Arunachal Pradesh at a high-level meeting here, chaired by Union Home Minister Rajnath Singh. 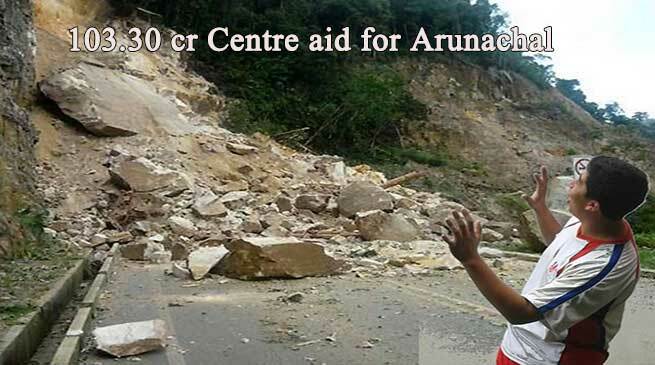 “The central assistance to the states of Arunachal Pradesh was approved in the wake of flash flood and landslides of 2016-17,” a Home Ministry statement said. In respect of Rs 103.30-crore central assistance approved to Arunachal Pradesh, Rs 81.69 crore will be given by the National Disaster Relief Fund (NDRF) and Rs 21.61 crore from the National Rural Drinking Water Programme (NRDWP). Union Minister for Finance Arun Jaitley, Minister for Agriculture and Farmers’ Welfare Radha Mohan Singh, Union Home Secretary Rajiv Mahrishi and other senior officers of the ministries of Home, Finance and Agriculture attended the meeting.